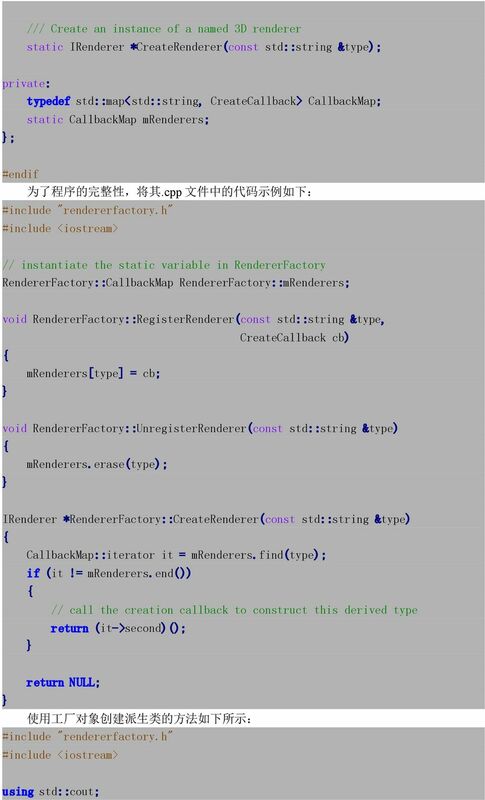 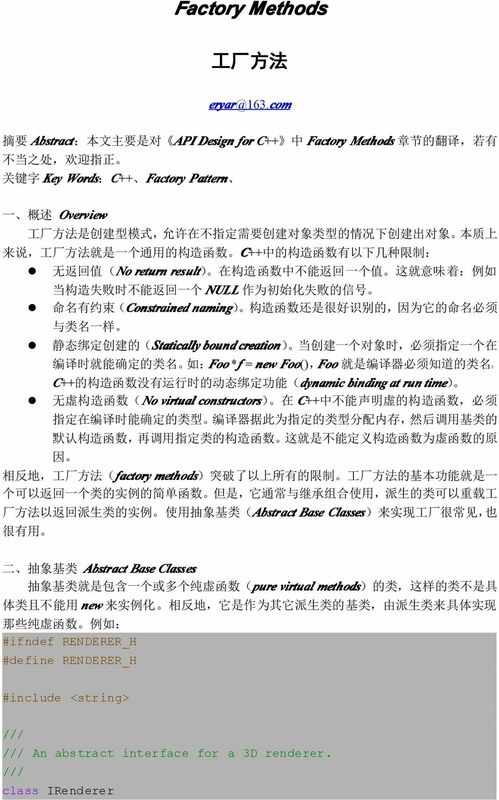 7 RendererFactory::RegisterRenderer("directx", DirectXRenderer::Create); RendererFactory::RegisterRenderer("mesa", MesaRenderer::Create); // create an OpenGL renderer IRenderer *ogl = RendererFactory::CreateRenderer("opengl"); ogl->render(); delete ogl; // create a Mesa software renderer IRenderer *mesa = RendererFactory::CreateRenderer("mesa"); mesa->render(); delete mesa; // unregister the Mesa renderer RendererFactory::UnregisterRenderer("mesa"); mesa = RendererFactory::CreateRenderer("mesa"); if (! 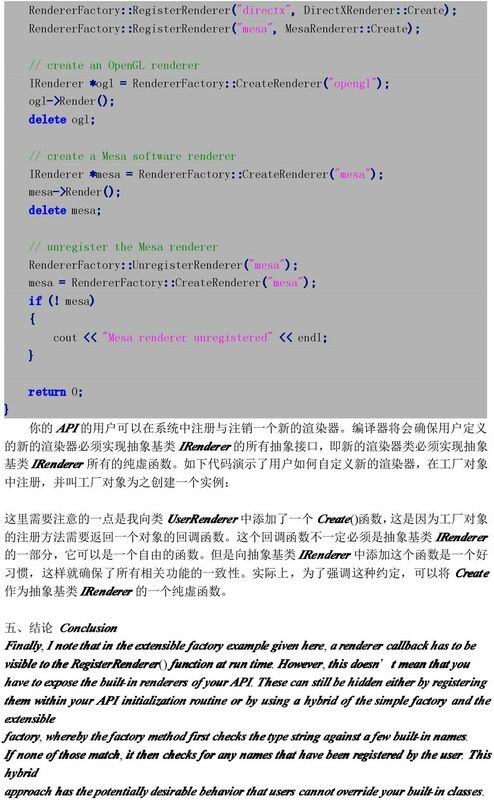 mesa) cout << "Mesa renderer unregistered" << endl; return 0; 你 的 API 的 用 户 可 以 在 系 统 中 注 册 与 注 销 一 个 新 的 渲 染 器 编 译 器 将 会 确 保 用 户 定 义 的 新 的 渲 染 器 必 须 实 现 抽 象 基 类 IRenderer 的 所 有 抽 象 接 口, 即 新 的 渲 染 器 类 必 须 实 现 抽 象 基 类 IRenderer 所 有 的 纯 虚 函 数 如 下 代 码 演 示 了 用 户 如 何 自 定 义 新 的 渲 染 器, 在 工 厂 对 象 中 注 册, 并 叫 工 厂 对 象 为 之 创 建 一 个 实 例 : 这 里 需 要 注 意 的 一 点 是 我 向 类 UserRenderer 中 添 加 了 一 个 Create() 函 数, 这 是 因 为 工 厂 对 象 的 注 册 方 法 需 要 返 回 一 个 对 象 的 回 调 函 数 这 个 回 调 函 数 不 一 定 必 须 是 抽 象 基 类 IRenderer 的 一 部 分, 它 可 以 是 一 个 自 由 的 函 数 但 是 向 抽 象 基 类 IRenderer 中 添 加 这 个 函 数 是 一 个 好 习 惯, 这 样 就 确 保 了 所 有 相 关 功 能 的 一 致 性 实 际 上, 为 了 强 调 这 种 约 定, 可 以 将 Create 作 为 抽 象 基 类 IRenderer 的 一 个 纯 虚 函 数 五 结 论 Conclusion Finally, I note that in the extensible factory example given here, a renderer callback has to be visible to the RegisterRenderer() function at run time. 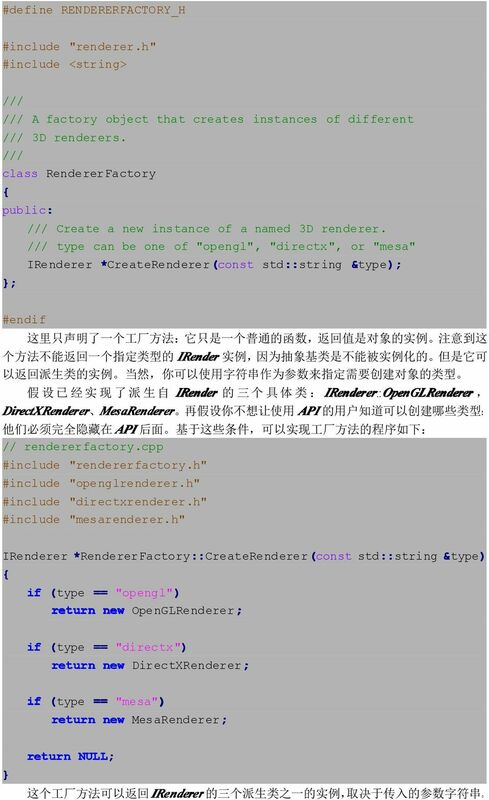 However, this doesn t mean that you have to expose the built-in in renderers of your API. 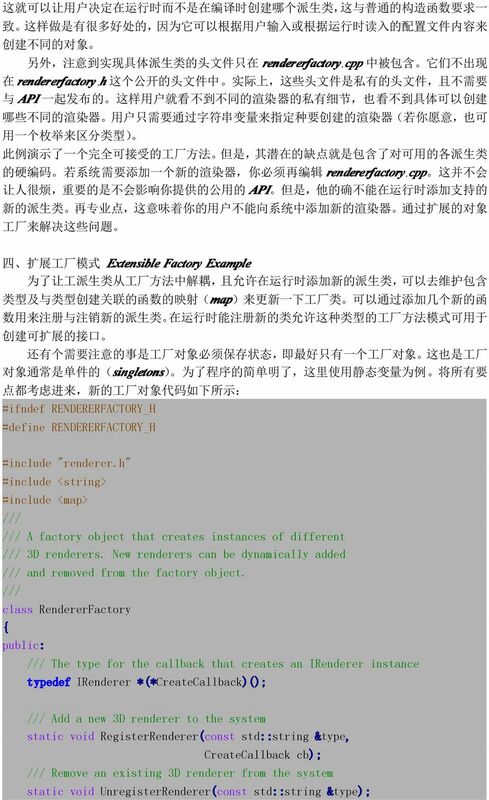 These can still be hidden either by registering them within your API initialization routine or by using a hybrid of the simple factory and the extensible factory, whereby the factory method first checks the type string against a few built-in in names. 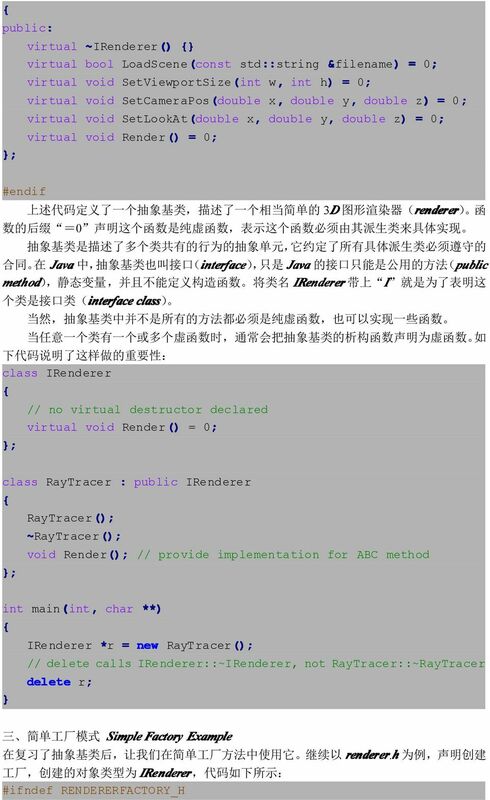 If none of those match, it then checks for any names that have been registered by the user. 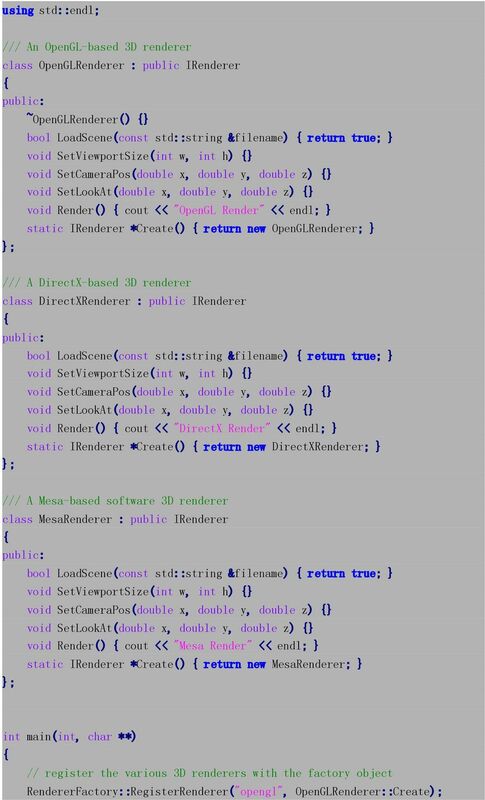 This hybrid approach has the potentially desirable behavior that users cannot override your built-in in classes.